Give your customers the advantage of improved safety and enhanced productivity through Genie Lift Pro, our machine specific operator training. As part of Genie 360 Support, we offer comprehensive operator training programs for all Genie equipment through Genie Lift Pro. Our manufacturer developed operator training programs are unique in the Australian market. We believe this exciting initiative will support your brand as an industry leader and a supplier of choice to your customers. Benefits of Genie Lift Pro for you. Advantages for your customers. We are proud to say that Genie is the only access equipment manufacturer offering machine specific operator training to end users. Genie Lift Pro makes perfect sense as it means your customers will be using your access equipment efficiently. With the backing of Original Equipment Manufacturer (OEM) machine-specific training, your customers could benefit from reduced risk of incidents and accidents coupled with increased productivity, while you enjoy the potential for savings on maintenance costs that flow from the correct use of Genie equipment. Genie Lift Pro will help you win more business. Think about it — when you next quote for a job on a construction site — not only can you supply the very best machines, but with Genie Lift Pro, you can show your customers how to use them proficiently. 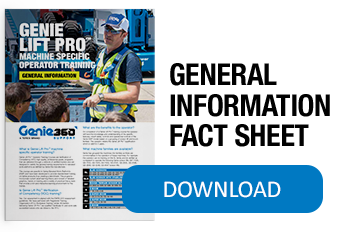 Genie Lift Pro Operator Training is the first manufacturer developed machine specific operator training program in Australia.